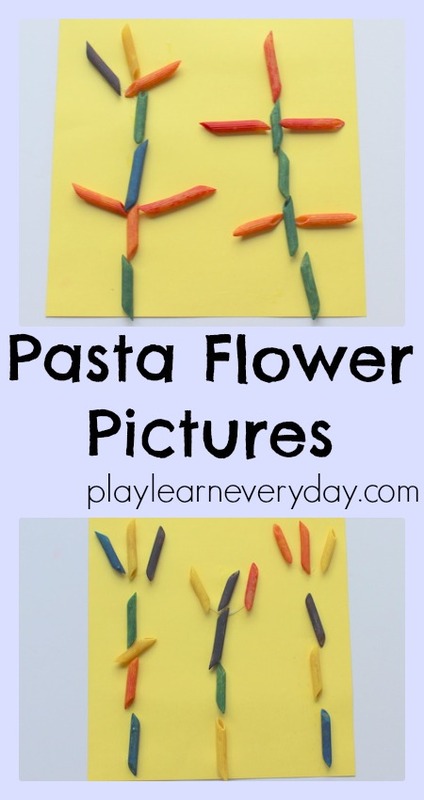 Today we are wishing the spring to come quickly and making some very cute pasta flower pictures to urge it on more quickly! These are so easy and so very much fun to make! We coloured a big batch of pasta in rainbow colours a few weeks ago and have already used it to do some threading and in a discovery bin, and today we're using that same pasta to make these lovely pictures. I highly recommend that you make a batch as it really can be used in so many ways! 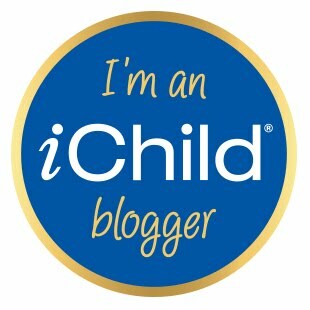 These pictures are very easy to make, and can be done in different ways for children of varying ages and abilities. For Ethan I just gave him a few little pots filled with different colours of pasta and asked him to make me a flower. I asked him to make a stem, leaves and petals and let him discover how to do that. He started by laying out the pieces of pasta on his paper, almost planning out how he wanted it to look, which I thought was a really good idea. Then instead of picking up each piece and gluing underneath it, he surprised me by using the glue to draw a line beside the flower he had made, then moved each individual piece over. I'm so glad that I didn't dictate how he should make it, as it was so nice to see his own method. For Ivy, as she isn't yet able to squeeze the glue bottle, I drew a flower shape with glue for her then asked her to put her pasta along the lines. Another method would have been to give her a pot of glue and a spreader to make her own creation. After seeing that I had done Ivy's glue for her, of course Ethan wanted to do a flower that was as well, so his finished picture has one of his own creation and one in which I glued the lines and he tried to use as many colours as he could to make a rainbow flower. 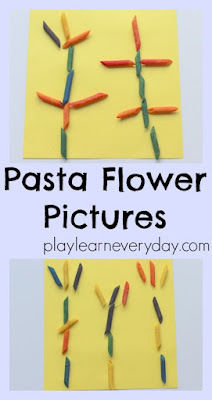 The kids really enjoyed this simple craft and it could be varied in so many ways, we'll definitely be doing a lot more sticking of pasta to make pictures in the coming weeks! This post is part of a Spring Ideas Blog Hop hosted by Craft Create Calm, check out all the other fantastic ideas!